On my GT155 this is  a P89LPC932A1, I assumed it had been programmed to interface with the LED display and take input from the main CPU. I traced 2 wires between this and the main CPU but couldn’t work out how it was being controlled (as I don’t have the right equipment mostly). 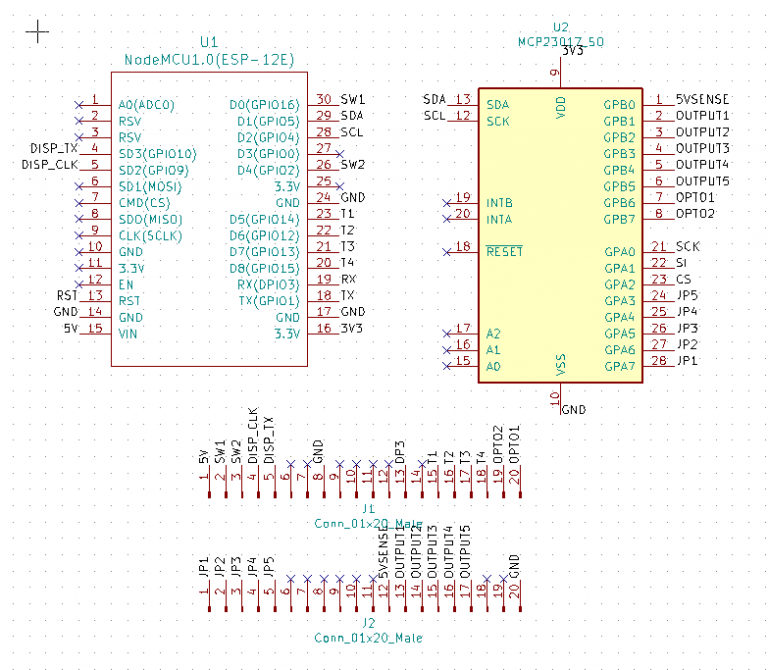 That was until I got hold of a GD131, which is essentially the same PCB except it has one less output (vt4) and has a different LED driver, it has  a M5480 LED display driver, which will drive 23 segments with brightness control. Since the main CPU on both these 2 board had the same software version sticker on them I could only conclude that the P89LPC932A1 was mimicking the behavior of the M5480. I guess Gledhill decided to change to a cheaper or more available chip and update the design a bit without needing the change the main software. This was helpful and now I had documentation on the serial interface to control the LED driver. These 2 opto isolators are Sharp PC814 “AC Input Photocouplers”. They are 1-channel with 5000Vrms isolation. 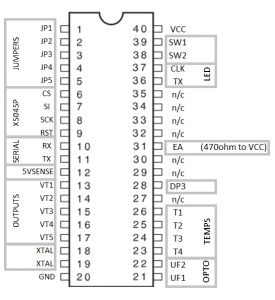 UF1 is wired to Room Thermostat, UF2 is wired to the HW clock programmer. The temperature sensors have a bunch of supporting components, diodes, resistors, capacitor. They each take 5V, GND and return a temperature signal. I have yet to reverse engineer this, but I suspect they are DHT11 or DHT22. I havn’t bought one  yet to take apart. Section 5 is all power supply type things, a fat looking diode, capacitor and transformer. It also includes a transistor that is switched on by the 5V power supply, which in turn makes a GPIO pin HIGH on the CPU. I don’t yet know what purpose this serves, maybe some kind of dying gasp. This is where the magic happens. 5 outputs are wired via resistors, with capacitors each to a transistor [VT1 to VT5] and LED which in turn enables a triac. When the GPIO output is LOW the triac turns on. VT5 = Not sure, seems to connect back to Neutrals of the Optoisolators via a fat Filtana inductor / capacitor, not sure what function it serves. This should be self-explanatory really. After ripping out the main cpu I wired an Arduino on the LED CLK and LED TX pins are started to attempt to drive the LED display. Once I worked out which segments where driven by which bit, it wasn’t hard to define the patterns to display numbers. #notadeveloperbytradedontjudgeme 🙂 I’m looking for feedback on how to make this neater, because this is all a bit arse. The output looks a little something like this. I can drive digits on the display! I can detect input from the optoisolators, drive the triacs on and off. 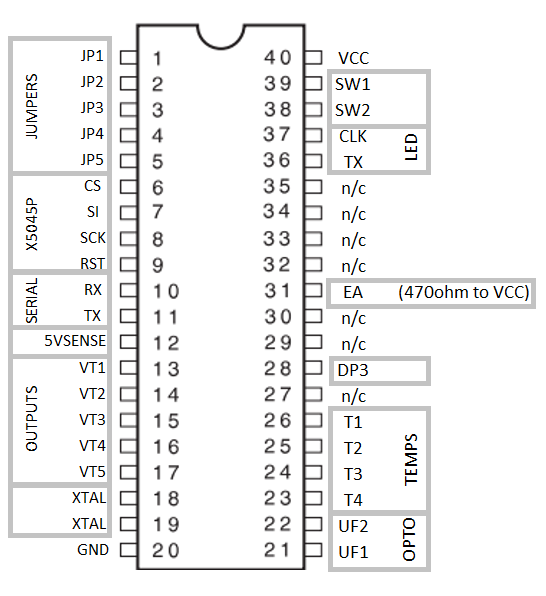 The arduino has no use for the X5045P nor the serial port really. It seemed only logical the next step was to design a “HAT” for the GT155 (and GD131). I needed more GPIO than my NodeMCU 0.9 would care to give me, so I have opted for the 23017 GPIO expander. 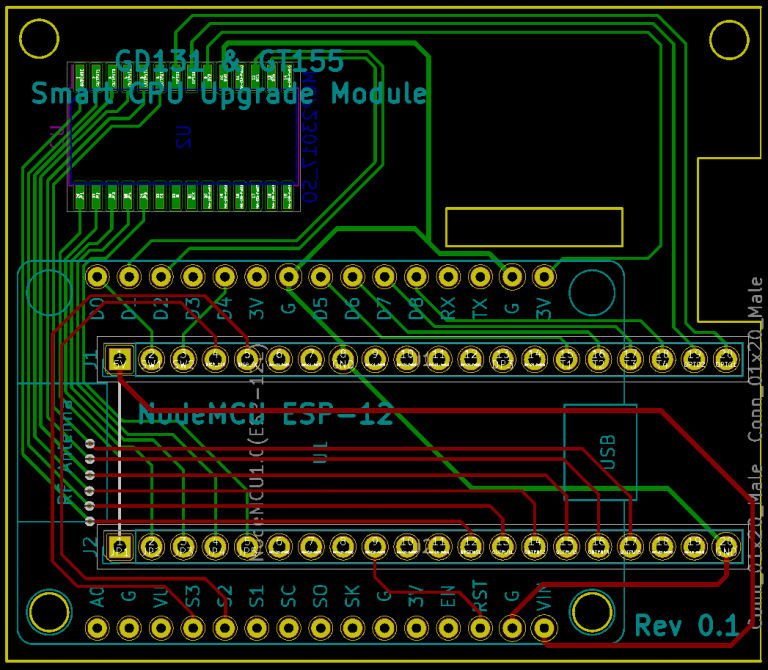 The PCB looks like this right now, with slots cut out for the LED driver ISP header and to avoid 2 capacitors. More work needs to be done to optimise, as there are too many tracks under the wifi antenna and the USB port is too close to other components to get the cable in whilst attached. It looks a bit like this in 3D. The 23017 is hiding on the back. This was the culmination of a years effort (on and off) to work out how these PCBs fail and attempt to use them for something interesting. I spent xmas 2017 with the flu with no heating due to a GT155 failing, so it was about time I got my revenge on it and forced it to release its secrets. The GT152 is a mini version of the board, it just acts as a pump controller but with much the same architecture, 2 temperature sensors and a triac driving the output. 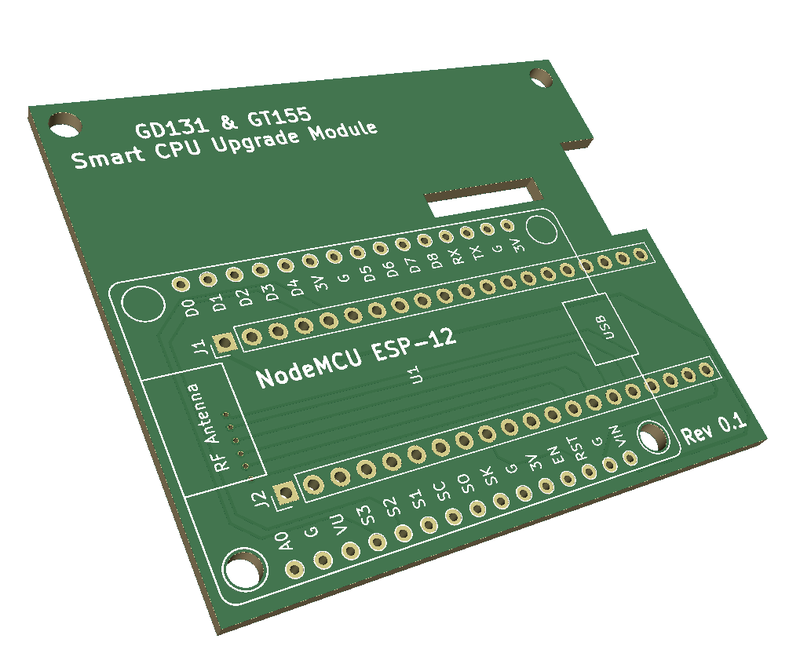 Once I have a prototype of one of these boards confirmed working, anyone who wishes to start hacking with these board can contact me and I can provide the schematic files or some spare boards. 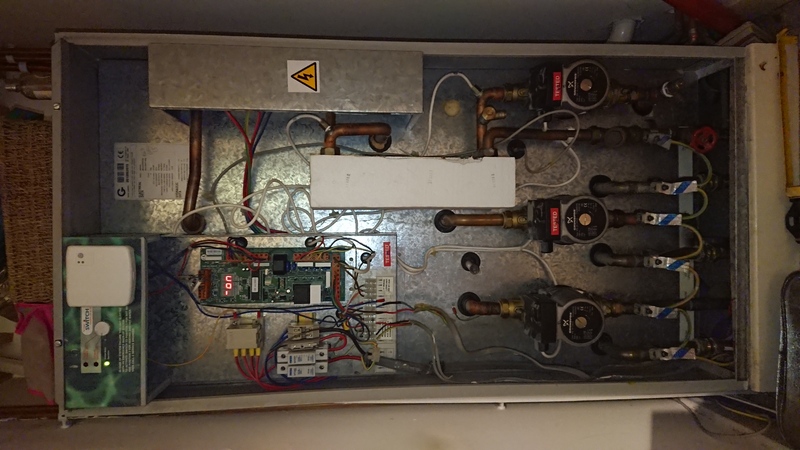 As I need to be able to safely operate the system with my own code without blowing up my boiler or pumping scolding hot water around the house 🙂 I dont know if I can recover a dump of the program from the AT89C55, I doubt it. Maybe the kind people at Gled hill will give me it 🙂 (not). Data / IFTTT notifications from the system regarding water tank temperature, pump activations etc. 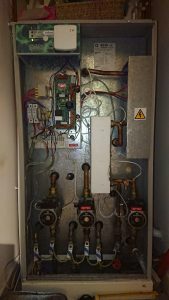 Interface directly to WiFi Smart Thermostatic Radiator Valves (remove wired thermostat) to create cost effective zoning (if I can find some) or via a controller / gateway. I provide no warranty with these instructions and any result of you making these modifications is not my responsibility. Making modifications such as these to your boilermate 2000 or any other boiler will invalidate any warranty it has, invalidate your boiler cover, invalidate any warranty for any work you had done on it, invalidate your house and contents insurance and will likely cause harm to puppies and kittens and cause you to instantly void your bowels. You have been warned.